The current load estimation method is recommended when only amperage measurements are available. The amperage draw of a motor varies approximately linearly with respect to load, down to about 50% of full load. (See Figure 3.) Below the 50% load point, due to reactive magnetizing current requirements, power factor degrades and the amperage curve becomes increasingly non-linear. 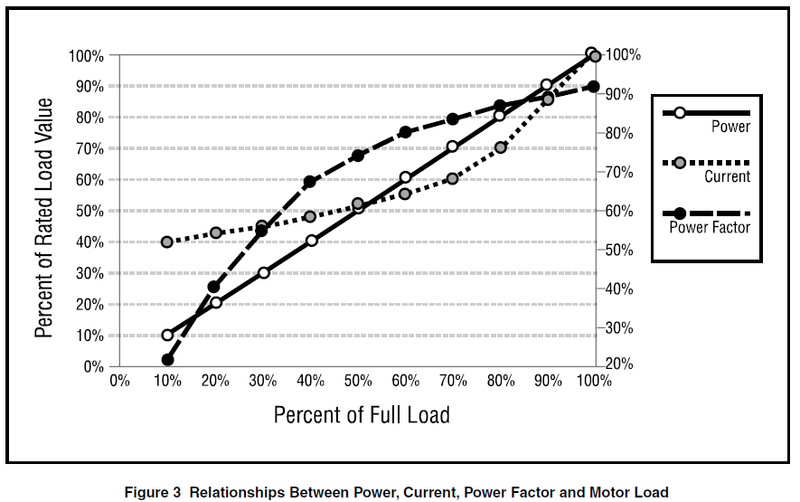 In the low load region, current measurements are not a useful indicator of load. Nameplate full-load current value applies only at the rated motor voltage. Thus, root mean square (RMS) current measurements should always be corrected for voltage. If the supply voltage is below that indicated on the motor nameplate, the measured amperage value is correspondingly higher than expected under rated conditions and must be adjusted downwards. The converse holds true if the supply voltage at the motor terminals is above the motor rating. The equation that relates motor load to measured current values is shown in Equation 4.